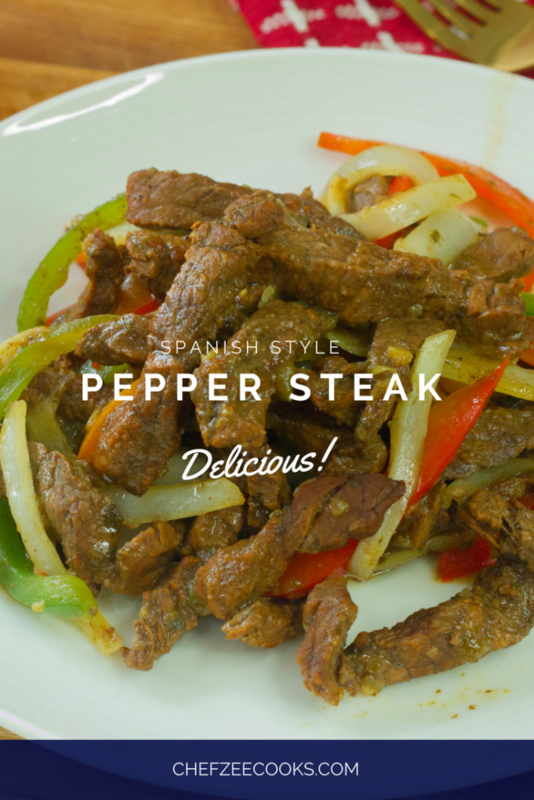 Pepper Steak is one of those Hispanic Dishes that masquerades as Bistec Encebollado and Carne Guisada. Sometimes, you don’t even know you’re having Pepper Steak until you stop and think about. 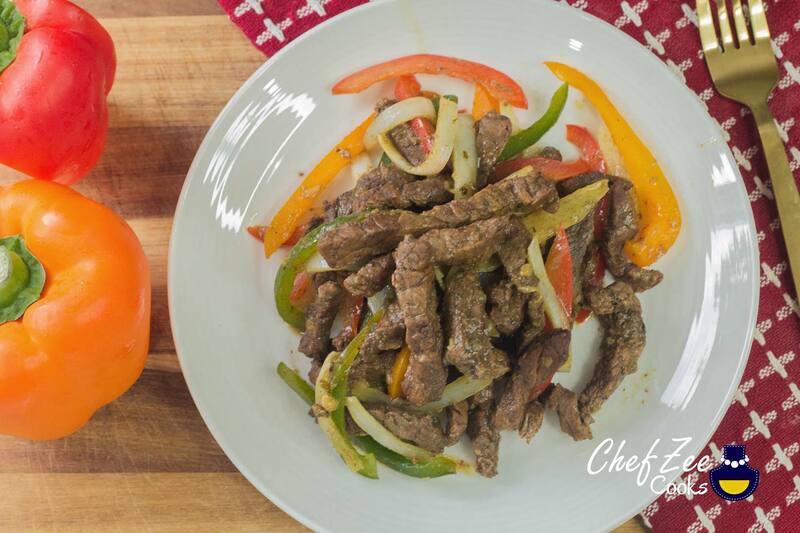 Unlike its twin brother and sister, Pepper Steak is made with strip steak and finished off with a variety of bell peppers. It’s insanely delicious and obviously pairs well with the dynamic duo– Rice & Beans. However, just because this popular dish is easily mistaken for others and widely made, doesn’t mean that people don’t get it wrong! In fact, I personally HATE eating this dish out at Hispanic restaurant because I never know if they’ll nail it on the head. To start, you have to let this dish stew for a at least 30 minutes for it to become tender. You want the meat to melt in your mouth. If it’s chewy then you know right then and there that you’ve undercooked it. And not undercooked it in the sense that it’s raw, but you haven’t let the meat do its magic. I’ve seen Pepper Steak be easily mistaken for Carne Asada– which is equally as tasty and my recipe will be coming SOON! If you can probably guess, the two dishes are worlds apart! Carne Asada is much simpler and faster to make. It’s also an entirely different cut of meat. It’s an actual steak that you don’t have to cook for long either. Am I in the mood for cubed steak, strip steak, or a regular flat steak? Do I want sauteed onions at the end or just peppers, or both? Do I want to spend a little or save some money? Your answer will determine which of the three amigos you should go with. If you’re in the mood for cubed steak, go with a Carne Guisada (even though ALL of these dishes can technically be called Carne Guisada. More on that in a later post.) If you want strip steak the go with Pepper Steak and if you’re craving a flat steak then Bistec Encebollado is the one for you. Whether or not the dishes have onions and peppers at the end is entirely up to the chef but Bistec Encebollado typically only has sauteed onions at the end while the other two have both. Pepper Steak will undoubtedly have much more peppers than the other two hence the name. And now for the question of money… None of these dishes are expensive to make but in my experience, Bistec Encebollado is the most expensive. I typically only make this for us at the house. If I’m making a huge portion for a family party of get together, I still with Pepper Steak or Carne Guisada since it’s more cost friendly. Lastly, don’t feel like you have to eat every Hispanic dish with Rice & Beans. I mean, yes this is the best way to eat them! But you can indulge in Hispanic foods without packing on the pounds! I love having Pepper Steak in lettuce wraps, tacos, or with an avocado salad. The carbs always get me but I refuse to give up all Hispanic foods for the sake of a summer body. Live a little! If you have kiddies in the house, try pairing this with mashed potatoes as well. It’s a great Hispanic-American hybrid that becomes an instant favorite! Be sure to pin this to your board!